Pampers Pure Protection diapers help protect your baby's skin with 0% chlorine bleaching and 100% Pampers protection. They are made without chlorine bleaching, fragrance parabens, latex*, and EU 26 allergens. Crafted with premium cotton, soft plant-based fibers, and other thoughtfully selected materials-2X drier** and more breathable than Honest to help protect baby's delicate skin. <br /> <br />Because your baby deserves skin-loving care without compromises, Pampers Pure Protection delivers up to 12 hours of trusted leak protection. They have features you and your baby will love, like adorable prints and our reassuring Wetness Indicator. And Pampers Pure Protection diapers are made with 100% certified renewable electricity and sustainably sourced wood pulp. <br /> <br />*Natural rubber latex <br />**based on Size 4. Average of 0.11g less after 3 typical wettings over 15 min. <br />The Seal of Cotton and cotton enhanced are trademarks of Cotton Incorporated. cotton enhanced soft outercover contains 15% cotton. Pampers Pure Protection diapers help protect your baby's skin with 0% chlorine bleaching and 100% Pampers protection. They are made without chlorine bleaching, fragrance parabens, latex*, and EU 26 allergens. Crafted with premium cotton, soft plant-based fibers, and other thoughtfully selected materials-2X drier** and more breathable than Honest to help protect baby's delicate skin. Because your baby deserves skin-loving care without compromises, Pampers Pure Protection delivers up to 12 hours of trusted leak protection. They have features you and your baby will love, like adorable prints and our reassuring Wetness Indicator. And Pampers Pure Protection diapers are made with 100% certified renewable electricity and sustainably sourced wood pulp. **based on Size 4. Average of 0.11g less after 3 typical wettings over 15 min. The Seal of Cotton and cotton enhanced are trademarks of Cotton Incorporated. cotton enhanced soft outercover contains 15% cotton. Received a box of Pampers Pure diapers at my baby shower and love them! They are soft, hold up great, and seem comfortable on my two month old. The designs are also nice. He hasnt had any leaks or blow outs! I plan on exchanging other brands that I have for this one. Highly recommend! I have tried nearly every brand out there, all to be disappointed. 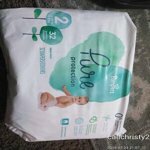 When I came across the pampers pure line I will never use another diaper ever! They hold a ton! I use them for day and night. I was shocked at how better they held up compared to Huggies night diapers. There hypoallergenic, super soft and do exactly what I want them too. Thank you for creating this amazing diaper! I will never buy another diaper brand again. The Pampers Pure Collection are seriously the best diapers I've used for my daughter. The biggest perk is that the diapers are made without chlorine bleaching, fragrance, parabens, latex or the 26 allergens identified by the European Union! Perfect for my daughters sensitive skin! We have had zero blow outs or leaks (knock on wood) since we've started using these diapers.The designs are adorable & I love the way they look. I really like the shape as well. They're comfortable on her and fit her well. No awkward spots or loose spots. The inside is very soft and not hard on her skin. I honestly don't know why I waited to jump on the Pampers team. The company sent me diapers to try, I loved them so much that when we run out, I will immediately order the biggest box I can find online. I'll never use a different brand again. Im so glad that pampers came up with these diapers, cuz they are just perfect for sensitive skin like babies have. I was using Pampers sensitive at first, and i was scared to switch to Pampers pure because of diaper rash, but no it wasnt a problem at all. He did not have any rash since I switched to Pampers pure. Thank you pampers for your great products. I just wish you can come up with bigger numbers. My second child always ended up with bumps on her bottom with all other diapers. It wasn't so bad with Pampers brand, so when we saw Pampers release the Pure collection we decided to go ahead and try it. Not once since switching to Pure has my baby girl had any bumps or rashes! After comparing the Pampers Pure Protection diapers with Pampers Swaddlers I found that the Pure ran a just a tad bit larger and were a little bit, barely even noticeably softer. 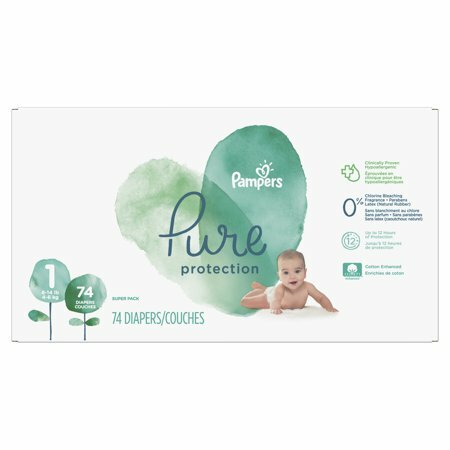 The Pure have cuter designs in my opinion but are really no different than a Pampers Swaddler diaper. I feel that the Swaddlers smell better than the Pure. But neither have an off putting smell. & overall I like Pampers Swaddlers better. Both are good diapers. I purchased these pampers for my infant and on several occasions she leaked through her clothes. I like the brand because it's natural and gentle on her skin and doesn't leave her rashes like other diapers. Also the wetness indication line is a plus. We want to make it up to you, Surayni, because it definitely doensn't sound like you got the Pure Protection experience you deserve! When you have a moment, please call us at (800)726-7377 so we can find out more about those leaks.